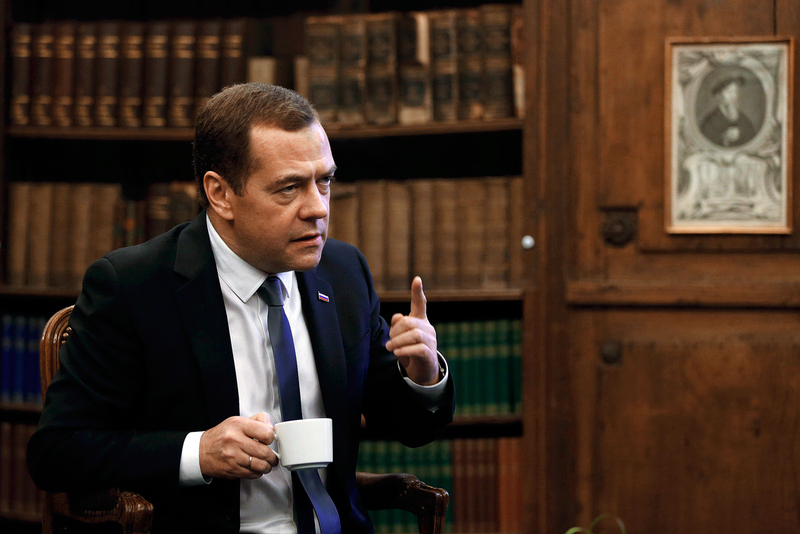 Dmitry Medvedev: "Companies are better off than individuals." Photo: Russian Prime Minister Dmitry Medvedev. Russian Prime Minister Dmitry Medvedev has published an article about the causes and results of the economic crisis in Russia in which he outlines the situation and the options facing Moscow. RBTH presents the 10 key points of Medvedev’s article. Because of the oil price slump, Western sanctions over Ukraine and structural problems, the Russian economy has found itself in a serious crisis. In an article (in Russian) in the official government newspaper Rossiyskaya Gazeta, Russian Prime Minister Dmitry Medvedev looks at the main cause of the crisis and its key repercussions, as well as the options the country faces in order to work its way out of crisis. The global crisis that has been going on since 2008 has resulted in growing instability on world markets. A global financial market has been formed that is capable of transferring huge sums of money almost instantaneously. Yet it lacks an adequate global regulatory system. Political considerations are playing a larger and larger role in economic policy, sometimes to the point of replacing market competition. Sanctions are merely a graphic illustration of this trend. In 2015, oil prices halved in a matter of about six months, which is unprecedented in modern economic history. However, the main factor remains rooted in the structural problems of the Russian economy, primarily the exhaustion of the economic growth model of the 2000s. A substantial reduction in growth rates started long before oil prices declined and sanctions were imposed on Russia. In late 2014, Russia was told that it was in for a disaster. And disaster could have happened had the government decided to fix the exchange rate, increase budget spending, freeze prices, etc. Instead, the authorities worked consistently to cushion the shocks. The results beat out most predictions. The share of non-oil and gas revenues amounts to almost 60 percent. Decisions to switch to inflation targeting allowed Russia to preserve its foreign exchange and gold reserves and ensure the stability of its monetary system. Inflation is steadily decreasing and will not exceed 6 percent this year. The Russian Central Bank closed 48 banks in the first six months of 2016 and 93 banks in 2015. Importantly, these measures did not cause a bank panic in Russia. Its banking system is fairly stable. In 2015, individuals’ bank deposits went up by 25 percent, and Russia’s corporate accounts grew by 20 percent. In 2015, capital outflow from Russia fell more than 2.5-fold to $58.1 billion, compared with $153 billion in 2014. In the first six months of 2016, it amounted to $10.5 billion, compared with $51.5 billion in the same period in 2015. Furthermore, Russia’s aggregate external debt decreased from its maximum of $733 billion in mid-2014 to $516 billion in mid-2016. The devaluation of the ruble has prompted industrial growth inside the country. In 2015, the food industry grew by 2 percent, chemical production by 6.3 percent and petrochemical production by 0.3 percent. The production of medicines has increased by 26 percent. Agriculture is demonstrating steady growth: In 2015 it grew by 3 percent, and in the first seven months of 2016 by 3.2 percent. The effect in the car making industry has been the most pronounced. Through the establishment of joint ventures with foreign companies, in 2015, the share of imports fell by 22.5 percentage points. There has also been a slump of 4.5 percentage points in the production of metals and metal ores, 7.8 percentage points in the manufacture of textiles and small wares, and 4.1 percentage points in food production. However, these stabilization measures are so far unable to compensate for the main consequence of the crisis – a decline in Russians’ prosperity: Disposable incomes and real wages have gone down. At the same time, Russian companies have over 21,000 billion rubles ($185 billion) in their accounts. To put Russia on the path to sustainable growth requires a substantial increase in the scale of investment, from the current 20 percent to 22-24 percent of GDP. It is necessary to develop measures that would not only incentivize savings, but also encourage their transformation into investment. The problem is not in interest rates but in the high level of uncertainty.